Tell us about your app just released a few days ago. As we take more and more photos every day, it has become harder and harder for us to find the one we want, when we want it. Traditionally, we manually put them into folders and organized them by time, locations, and events. Today, particularly on smartphones, we don’t always have that luxury. Finding THAT photo NOW is more difficult than ever, as more photos are generated. Who is on the team and what are your roles? Yi Li, CEO, Meng Wang, CTO, Tianqiang Liu, VP of Engineering, Richard Michaels, VP of Business Development, Yushan Chen, Product Manager, and Yuanjing Xue, Front-end Engineer. How is the app different from similar apps? 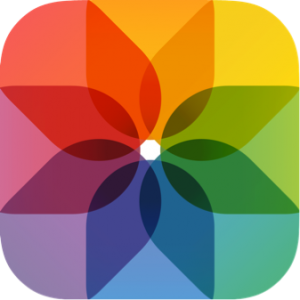 ReKoMe is here to help users to quickly find their photos. We simply add a search bar on top of you photo albums. You could find photos by inputting keywords related to the photos like hat, wedding, dessert, etc, selecting a time range, or choosing the location where the photos are taken. The magic part is that ReKoMe will automatically recognize patterns, guess what’s inside the photos and generate keywords accordingly. The location is generated using the geo info of the photos. Now, with ReKoMe, when I want to show my friend photos of my cat, I could just simply type cat and pull out all the photos of my cat. Note that the initial automated indexing of all the photos will take some time (4 mins for 1000 photos under WiFi condition). The photos only need to be indexed once. After the keywords are generated, the users can start searching. Other applications such as Everpix, Picturelife, Keepsy, Snapjoy are also trying to organize photo collections. The largest difference between ReKoMe and those other apps is that we leverage powerful cloud-computing with our ReKognition engine (rekognition.com). ReKognition has been up and running as an open API platform for more than 2 years now and is processing over 3 millions photos every week. Over the years, it has been trained with large amount of uploaded photos and can recognize over thousands of different concepts, such as objects, scenes, and animals. Tell us about the design. 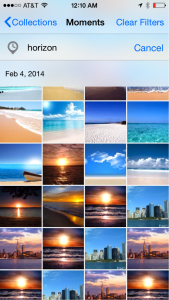 To reduce the learning curve, we have kept the same photo display layout as the original iOS 7 “Photos” app. All the photos are naturally organized by time and location. 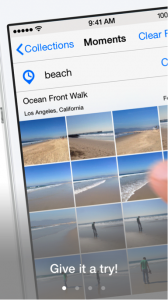 A search bar is added on top of the photos albums for typing keywords. 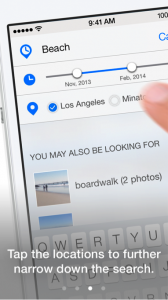 With just a tap and a slide, the users can also narrow down their search using time and geo location. What assisted you in building the app? ReKoMe is powered by ReKognition API (http://rekognition.com/). During the development, we have found google, stackoverflow, github, flurry, extremely helpful. What went right and wrong with the release? ReKoMe’s first appearance was actually not at Macworld, but at the Launch Festival held in San Francisco at the end of February. With great enthusiasm, we stood in front of the demo table and tried to introduce our products but there wasn’t much interest. At that time, ReKoMe is hard to use. But a month later, we launched the new ReKoMe at Macworld and am happy to say that we received a lot of positive feedback from the people attending Macworld and those that heard about us since the show. Actually, the first version of the interface was very fancy – after indexing the photos, the system will automatically generate tags for who and what’s in the photos, such as beauties, trees, car, building, etc. The recognition engine supports more than 20,000 categories. All these calculation is running in the background, and then a nice photo album is present to the users with slow animation, fade-in and fade-out effect to display the photos. For example, the photos of my friends are grouped into various collections: “People”, “Sunset”, “Food”, “Snow”, just to name a few. When you open the album “People”, there are also subsets for specific people and proper names such as “Mom”, “Me”, “Mark”. While we plan to add that function back in the future, we had to limit the scope at this time. Technology wise, it is very cool to automatically identify thousands of images without having to manually tag photo. But, it is still is not enough. After the event, we tried to figure out where we should focus on improving first. Speed, accuracy, or UI? And finally, we turned our attention to the most important group – users. Why do most of the people think ReKoMe has a very cool technology but not interested in using it? The first question is, who are our users? The grandfather walking in the park, mom shopping in the supermarket, and people who love to travel and take photos. In general, people who take a lot of photos and would like to share their photos with their friends. So, we decided to build our product, for them. We started to ask feedbacks from various people, including friends in our neighborhood, and even people we ran into in Shoreline park. The feedbacks we got the most is that they think the product is good, but do not feel they are useful – too many human faces in the photos, too many tags. Using the albums to categorize photos are not efficient enough. Also, the albums are ranked by the number of photos. So even some photos are very important to us, they might be buried in other large albums. Then, what do people want? These are the wants and needs we hear the most. So when we are building the second version of the app, the SEARCH becomes the primary function. Not only the users can search by typing related words, but also by applying the address and time filters. What is the result of this big change? People like it and really think it will be useful! They are so happy to know that the Beta version is free to download and want us to quickly release the official version in the App Store, so that it is easier to recommend to friends. Our technical co-founders Meng and Tianqiang are also from BU Ph.D program, and they have years of research experience in Computer Vision. Meng has worked in Mitsubishi Lab, Google Research and YouTube. 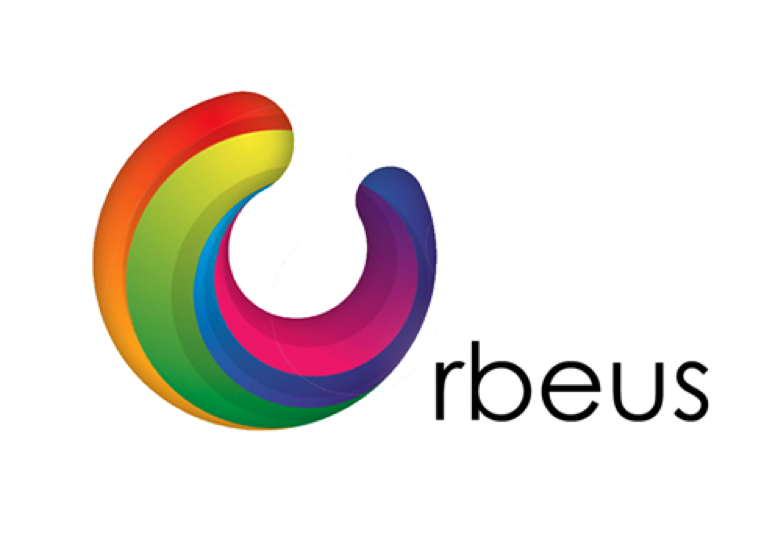 During his time in Youtube, he came up with this idea of using image recognition technology to automatically generate keywords for videos, which leads to Orbeus in the end. Tianqiang has worked in Visual Measure, handling large video data analysis and infrastructure. Yi received her Master degree in Information Systems from Bentley University – McCallum School of Business. Prior to Orbeus, Yi worked as an IT consultant at Merkle Inc and IBM (China)'s Global Technology Services (GTS) unit. Richard has worked in both technical and business roles in the semiconductor and software industries, including Mitsubishi, Marimba and BMC Software, and holds an MBA from Columbia Business School. What other apps inspire you? Wechat – just do one thing that people need to use every single day and make it dead simple to use. Just do one thing and do it extremely well. Google Maps – a service supported by advanced technology, which improve people’s daily life significantly. Technology is the most powerful fuel. Head over to the Apple App Store to download ReKoMe. Hey you app devs! Wanna be featured like our friends at ReKoMe? Be sure to check out http://www.powerslyde.com/get-discovered.